His ancestry moved from Gospic to Stikapron 300 years ago. He also lived the first years of his life in Stikapron (Steinbrunn) in Austria. He graduated in Mathematics in Vienna, and moved to Zürich, Switzerland, where he was working in the computer technology. His family: two daughters, one son and seven grandchildren. He says that he always was religious “I`m a believer since my childhood, I love to meditate and to pray. Prayer is for me a dialogue with God who feeds the hungry and gives drink to the thirsty”. And he loves good communication with people. One very important thing in his family is tolerance, because his wife, his son and one of his daughters belong to other denominations. “We reach to one another, this is important. God is one, we only approach him differently”. He says that young people often aspire to fun, and not to God. “They live without God, but when something goes wrong, they do aspire to Him”. 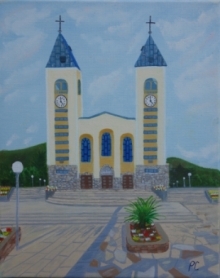 Medjugorje became an important place for Jožef. “I pray for my wife’s health, and whatever happens will be the will of God. I want to tell Mother Mary that I am here and ask her what I have to do”. He will go back to Zürich by bicycle. He said:”It will take around two weeks, because I want to visit Gospic to investigate the origins of the Ratkovic family”. If you also want to make a special experience visit Medjugorje, stay at one of its beautiful Medjugorje and feel the magic.